If you’re looking at buying a guitar amp, you might get overwhelmed when you see all the different types of guitar amps out there. With so many different brands, shapes, sizes, and features, it can be hard to figure out what is the right guitar amp for you. In this guide, let’s take a look at the different types of guitar amps out there and find which one might be right for you. There are four main types of guitar amps: tube, solid state, modelling, and hybrid. Each type of amp uses a different type of technology to produce your tone. All four types of guitar amps also come in different configurations of speakers, which play a big part in shaping your tone. Even if you think you already know what type of guitar amp is right for you, read through the information on all four types. Knowing more about other types of amps will help you make sure you do make the right choice for your needs. As a guitar teacher, I often see guitarists with the wrong type of amp for their needs. Being open-minded about different types of amps will lead you to better gear. If you’ve ever heard somebody talk about guitar amps, you probably heard them talk at some point about tube amps (also known as valve amps). For many guitarists, tube amps are the pinnacle of amp technology and produce the best tone. Whether that’s true or not has been and will always be a hot debate because tone is completely subjective. The above photo shows a typical tube in a guitar amp. These tubes will heat up and glow orange when they’re cranked up. The basic idea is that when you crank up the tubes, they start to break up your signal and produce a smooth overdrive so many guitarists enjoy. Tubes were used in all amplifiers before transistors were invented, but many guitarists still prefer to use a tube guitar amp today due to the warm tones they can produce. If you hear somebody talk about valve amps, they’re the same as tube amps. “Valve” is an English term, while “Tube” is an American term. They both refer to the vacuum tubes/valves in the amp. Compared to the other types of guitar amps covered later, tube amps use ancient technology. This adds to the appeal for some guitarists. Some guitarists like the idea of sticking to vintage gear and consider it “the real stuff”. Other guitarists take a look at what is possible from modern guitar amp technology and decide that tube amps aren’t worth it. The right choice for you is to look at each type of guitar amp objectively and whether the type of amp fits your needs. Most guitarists don’t do this and as a result, they end up with an amp that doesn’t suit them. While many guitarists will talk to you about the benefits of tube amps until they’re blue in the face, don’t feel like you need to buy a tube amp. They don’t suit all guitarists and having a tube amp doesn’t guarantee the best tone. The highly sought-after warm tone of a tube amp does come at a cost. Tube amps are typically far more expensive, heavier, and more fragile than other types of guitar amps. The easiest way to tell if a guitar amp is a tube amp is to try and pick it up. You’ll notice a huge difference in weight in a tube amp compared to any other non-tube amp. Tube amps can be ridiculously heavy and fragile. The extra weight is fine for at home use, but if you plan on traveling with your amp to gigs or band rehearsals, you might find the extra weight of a tube amp a hassle. 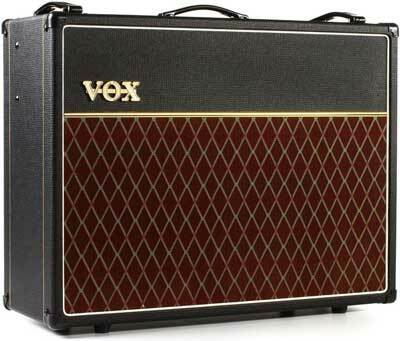 The above amp, a VOX AC30, is a great example of a very popular tube amp. It might not look heavy, but at just over 70 lbs (32kg) it’s far heavier than a solid state or modelled combo amp. 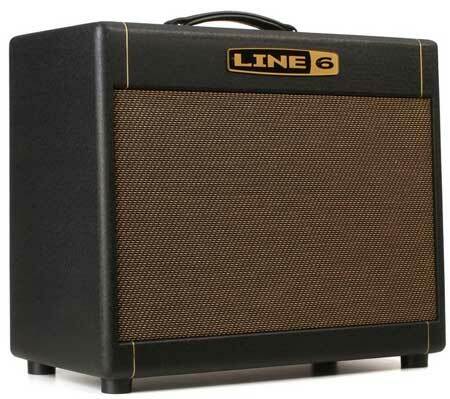 For example, the Line 6 AMPLIFi 150 is a modelled combo amp that weighs 37lbs (17kg). Even if you have your mind set on getting a tube amp, have a read through the different types of guitar amps to see how they compare. You may find tube amps suit you the best, or you may find a better alternative. After the transistor was invented, a new type of guitar amp started to appear. Solid state guitar amps replace glass vacuum tubes with transistors on a printed circuit board. It should be obvious that there’s a big difference between the two. A transistor is rock solid, extremely light, and reliable. A glass vacuum tube in comparison can break or burn out over time. 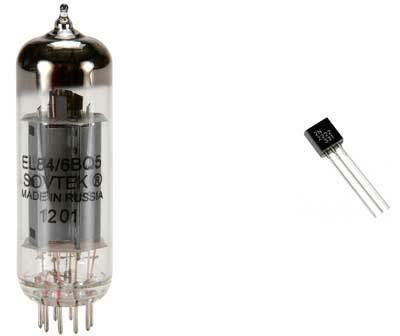 The big advantage of transistors is that they won’t burn out as a vacuum tube will. They don’t require maintenance and should last a lifetime. It should be no surprise that solid state guitar amps can be far lighter than tube amps. You may have heard of transistors when people talk about fuzz pedals (find out about fuzz pedals and transistors here). For many guitarists, the big drop in weight and price is a big reason for choosing a solid state guitar amp over a tube amp. When solid state guitar amps first came out, they were seen as cold and sterile. The warmth and inconsistencies that gave tube amps their character were suddenly gone when you plugged in a solid state amp. 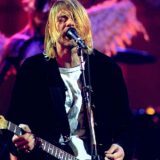 For many guitarists, this was a step backwards. For guitarists in styles like Jazz where you want a sparkly clean tone, solid state amps were ideal. 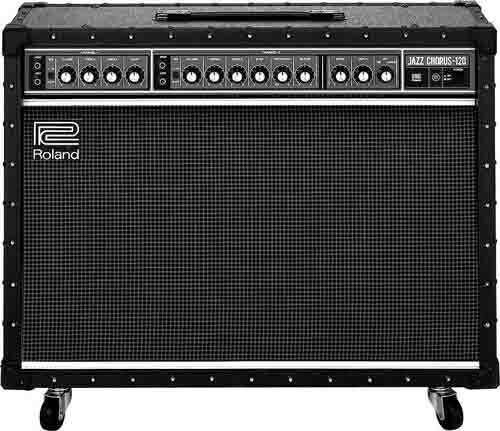 The above amp is a Roland JC-120 (JC stands for Jazz Chorus). The JC-120 still stands out today as one of the best solid state amps available. For many jazz guitarists (and other similar styles), the tone it produces is perfect for their needs. The above JC-120 weighs 62lbs (28kg) which might sound like not much different than the VOX AC30 from earlier (at 70lbs / 32kg). But keep in mind the JC-120 is a 120-watt amp while the VOX AC30 is a 30-watt amp. The point to take away here is that different amps suit different types of guitarists. A rock guitarist might see a solid state amp as cold and sterile, while a jazz guitarist might see a tube amp as noisy and mushy. It’s also worth mentioning that many rock guitarists enjoy using solid state amps and many jazz guitarists enjoy using tube amps. Every guitarist has different tastes and preferences in tone, so don’t let anybody tell you what type of gear you should be using. Solid state guitar amps aren’t as popular today as they have been mostly replaced by modelling amps. Modelling guitar amps (sometimes called digital guitar amps) are an evolution over solid state guitar amps. These guitar amps use modern technology to produce a wide range of tones and effects. 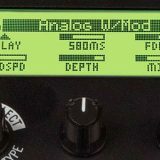 The name ‘modelling’ comes from the idea that the amp tries to recreate the tone from a different type of amp. For example, a modelling amp may attempt to reproduce the tone of a Marshall tube amp without the use of tubes. Then with the press of a button, you can change to a modelled version of a classic VOX AC 30 or a Mesa Boogie. The big advantage of modelling guitar amps is flexibility. Some modelling amps give you access to hundreds of different amp models, inbuilt effects, and presets. 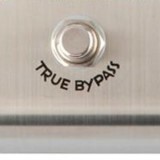 When modelling guitar amps first started appearing, they quickly developed a terrible reputation. Guitarists called them digital rubbish and poor imitations of the real thing. If you try out an early model of a modelling guitar amp, you will probably agree. Thankfully, as with any technology, modelling amps kept getting better over time. Every year saw improvements in modelling technology and better quality tones. When listening to the examples from the above video, don’t try to think which one is “real” or “modelled”. It really doesn’t matter if you can correctly identify which is which. What really matters is if you like either or both of the tones the amps produce. While there will always be guitarists that claim that “nothing beats the real thing”, the truth is modelling technology is at the point where a good quality modelling amp can sound almost indistinguishable from the non-modelled version. The four main amp presets (plus an original BOSS acoustic amp) found on the BOSS Katana are based on these guitar amps: Roland JC-120 (Clean), Fender Bassman (Crunch), Peavey 5150 Lead (Lead), Soldana SLO-100 (Brown). A modelling amp like this one gives you access to the guitar tones found on some of the most famous guitar amps in history. Some modelling amps allow you to access literally hundreds of different amp models all in one unit. 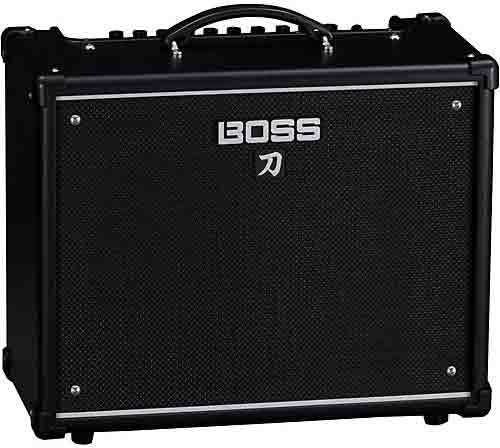 The Boss Katana KTN-50 is a 50-watt amp that weighs 25lbs (11.6kg). When compared to the tube or solid state amps shown earlier, it should be obvious how much lighter a typical modelling amp can be. This is partly why they’ve become so popular for guitarists going to band practice or gigs. Not only are they easy to transport, but they provide a lot of flexibility in tones. If you’re looking at getting a modelling guitar amp, remember that modelling technology is constantly improving. So when it comes to modelling amps, if you have to choose between an older or newer model from the same brand, the latest model is usually the smart option. The last type of guitar amp worth mentioning is hybrid amps. Hybrid guitar amps are a bit of a weird type of amp. Just like hybrid cars are a weird mix of gasoline and electric, hybrid guitar amps are a weird mix of different amp technology. The idea behind hybrid guitar amps is that they give you the best of both worlds. You have access to the sought-after tones produced by tubes and you also get access to the flexibility of solid state technology. While that might sound great, hybrid amps can often be disappointing in the same way that hybrid cars often disappoint. A hybrid car has great advantages over a gasoline car, but it comes with compromises. A hybrid car has a gasoline engine, but that engine is nowhere near as good as a gasoline car’s engine like a Mustang. A hybrid car also runs on electricity, but it’s nowhere near as good as an all-electric car like a Tesla. Hybrid cars are a compromise – it’s not as good as a gasoline car and not as good as an all-electric car. It’s somewhere in between. It’s the same with hybrid guitar amps. Most guitarists will either prefer a classic tube amp or a modelling amp, but not a weird hybrid of the two. Hybrid guitar amps do suit some guitarists, but fewer and fewer guitarists are finding these type of amps appealing. For some guitarists, a hybrid amp is the only time they will consider using modelling technology. For these guitarists, the tubes give the “real” character other modelling amps lack. Whether this is true for you or not depends on the type of tones you like from a guitar amp. The DT25 combo weighs 47lbs (21kg) which is lighter than a typical tube amp, but heavier than a typical modelling amp. Just like hybrid cars, hybrid guitar amps do suit some people. While there aren’t many hybrid guitar amps out there compared to tube or modelling amps, there are some great options worth considering. Now that you’ve read through the four types of guitar amps, you should have a good idea on what type of you should get. Before you start to think about brands or amp models, be clear in what type of amp might suit your needs best. For example, if you feel a tube amp would suit you best you can then start researching tube amps and find the brands and models that suit you. You can narrow your search down to tube amps and compare the different models from different makers and find the right tube amp for you. This is a far better approach than what many guitarists do. Many guitarists start with a brand, then look for a model. This is a poor approach because it immediately restricts the wide range of amazing amps you could choose from. The reason I want to emphasize this is because guitarists can often be closed-minded. I’ve seen many students over the years come to me with a horribly inappropriate amp for their needs because they were told to “only get a tube amp” or “nothing beats a Marshall”. Do I need to regularly transport the amp? How loud does the amp need to be? 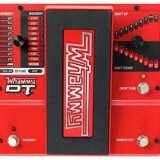 Will I be using pedals for my effects, or do I want to have the amp do everything? How many different types of tones do I want to access? Will I be recording music with the amp? Will I be performing live with the amp? Take your time answering each of the above questions before you make your mind up on the type of amp to get. Once you answer all of the questions, go through each of the four types of guitar amps and think about how closely each type fits with your needs. Keep in mind that each type of amp can come in very different configurations. For example, while tube amps are typically heavy, there are tiny tube amp heads such as the Orange Tiny Terror you could match with a small speaker cabinet. This approach gives you an easy way to objectively compare the different types of amps and help you work out which type really would fit your needs. To learn more about guitar amps and how to get the most out of your amp, read through my Ultimate Guide to Guitar Amp Settings. Many guitarists have contacted me over the years to say that it was one of the most important articles they’ve read. So if you want to get the most out of your amp, check it out.